This amusing expression actually has two quite different meanings. 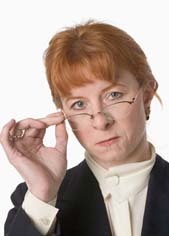 One corresponds to the bad-tempered or disapproving woman mentioned above, and shown in the photo. A similar meaning describes a person, usually female who annoys people just by talking! The other meaning describes a boiled sweet which is very strong and sharp tasting. An example might be Fisherman's Friend lozenges which contain menthol and eucalyptus.